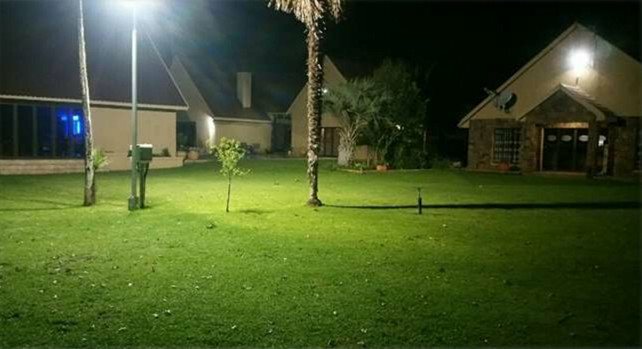 Property is 23810m2 in size, situated in a lush garden with an abundance of bird life, guinea fowl, peacocks & the odd rabbit in the evening. It is tranquil & relaxing. 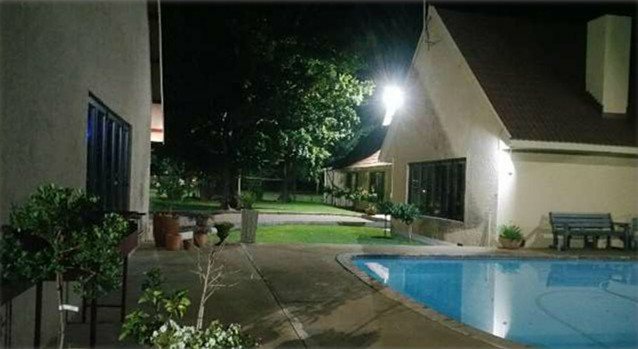 In the evening, the property is well lit up, managed by day/night stations for your convenience. It boasts comfort & spacious living for the discerning owner having the facilities of a newly constructed entertainment area with direct access to a sparkling swimming pool & allowance made for a swimming pool heater. While the children have their own entertainment room with all the features & an installed uncapped Wi-Fi System for internet gaming, Mom & Dad & friends can relax in the pub watching their favourite sporting event any day of the week. An awesome walk-in dressing room for Mom with an abundance of cupboard space. The office layout is forgiving in the sense that you can trade almost any business you wish irrespective of your profession due to the serenity of the area. You simply walk out of your front door and into your office at your convenience, any time of day or night. It has a functional satellite system which is an optional extra if required. Wi-Fi system is currently installed for all network & business activities & have multiple computers running of this Wi-Fi System with large detailed programmes. Sufficient cupboard capacity and well air-conditioned in all offices. A boardroom for those private meetings if so required with fridge facilities in the boardroom & a mini-kitchen to prepare hot drinks. A well-equipped 3 phase workshop suitable for any owner to meet his required needs. Ample parking for staff members, a lockable storeroom to safeguard materials & stock. Entire workshop premises all well-lit in the evening with armed response patrolling continuously. The property consists of the following and is a running business concern. Offices could be utilised for doctors consulting rooms, Minor law practice, physiotherapist, dietician, psychologist or similar, Transport Company, small engineering works, fabrication entity etc. The entire home has been fitted with the latest Aluminium window shutters to the value of R 380,000.00. This serves as a security mechanism. All rooms have wall mounted televisions with DSTV coverage, including kitchen. All entrance doors to home have Trellidoor Security Gates. Entire home has been renovated with the latest modern finishes. All floors retiled & main bedroom & dressing room fitted with new carpet. New ceilings installed throughout the home. New car ports to accommodate Eight vehicles. New 63Kw Generator – This provides power to entire property including 3 Phase workshops. All old grass removed, fertiliser imported & new grass planted. Still busy with backyard operation. The purchaser has the choice to purchase items which are not included in the sale of the property, ie Snooker table, sleeper table in entertainment area, kitchen handcrafted dinner table, boardroom table in office, portraits in snooker room, all televisions & Big screens, Hi-Fi Systems, Big Screen Projectors, John Deere Ride on Mower and any other items that the seller identifies.